Effective recruitment takes a lot of time and energy and can be difficult to get right. It is easy to over-complicate hiring criteria, focus on the wrong attributes, or overlook the importance of cultural fit. Therefore, it’s important to get the right balance between defining the role, responsibilities and fit to your culture, specifying the skills your business needs and then finding and interviewing the right people quickly. Helping your new employees to settle in to their new roles efficiently so they quickly become productive can also be an intensive process. It is critical to give the new person a clear understanding of what is required of them, and to convey this with the support and guidance of their manager and colleagues. Having a clear description of the job purpose and a person specification that defines the skills and experience you are seeking will make the job of recruiting, engaging – and then retaining – the best staff much easier and more effective. 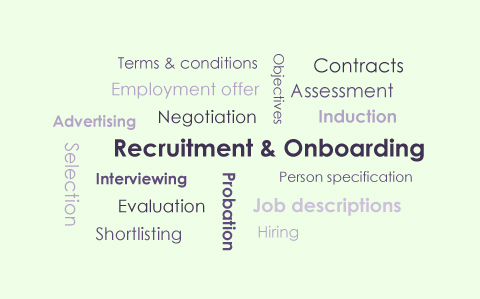 GrantaHR can advise and assist with all aspects of recruitment and on-boarding. Probation period management including tools, guidance and coaching for supervisors and managers. We can advise on or carry out individual elements of the process for you or manage the entire recruitment and on-boarding project end to end. Whichever way you use us, we’ll ensure that your processes follow good practice and are professionally tailored to your business. If you would like to know more about these or any other aspects of recruitment and on-boarding, please contact us or ask about our free HR Health Check.